FK Lowry Piling recently completed piling works at Suffolk EfW (Energy For Waste) Project for parent company Lagan Specialist Contracting Group. The project comprised of a central 15x40m wide waste bunker 10m deep, with associated surrounding utility buildings consisting of a Boiler and Tipping Halls, Technical and Electrical workshops and administrative offices. The piling works consisted of 170 no 900mm diameter CFA piles up to 20m deep forming secant retaining wall for the waste bunker. 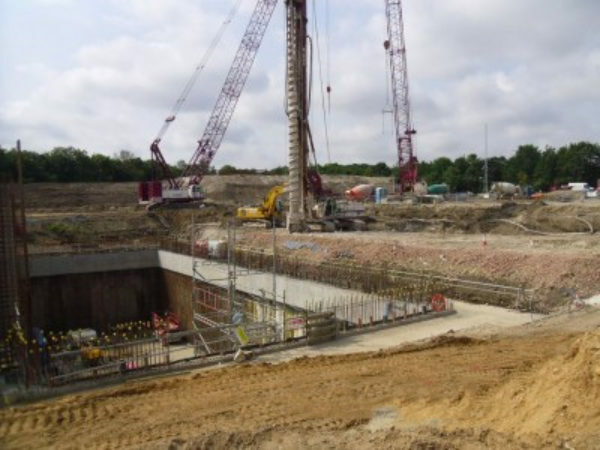 The secant wall was constructed using hard/firm alternative piles at 650mm centres forming a water tight bunker with assisting reinforced concrete liner wall. To ensure interlock of piles at depth and mitigate water ingress, tight piling tolerances were adhered to. Hard piles were reinforced with 1.6 tonne 17m long cages inserted with attending handling crane and vibratory techniques. Bunker piling construction was from a reduced level with restricted access for 2no 70 tonne high torque piling rigs, 180 tonne handling crane and associated plant. The varying utility buildings consisted of approximately 600no CFA bearing piles ranging in diameter from 450mm to 900mm, to depths of 23m. With the 2no CFA rigs utilised throughout, daily concrete consumption was in the region of 250m3 with the same volume of spoil generated and removed by Lagan Construction Group. Collectively, both teams co-ordinated the large volume of plant and deliveries, whilst adhering to neighbouring Network Rail constraints and environmental constraints due to underlying aquifer. Pile design and construction was verified by 3no preliminary pile tests up to 520 tonne, working dynamic tests, inclinometer monitoring and 100% integrity testing.